Scout and Madeline are settling into the idea that they are temporary backyard goats. Initially, they were not all that excited about actually doing their lawn-mowing jobs. There was a bit of upset - particularly by Scout - that the goats were not allowed in the house. (Note that Scout hasn't actually been allowed inside a people-house in over five years.) But things are mellowing out. The goats and the humans are chillin' together now. I did consider that possibility. 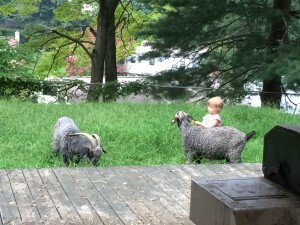 Goats are like dogs in that way - little statisticians.